This is a sponsored post written by me on behalf of Yumbox. All opinions are my own. In just a few weeks, I’ll have a teenager living in my house. What the heck?! I started packing this kid’s lunches ten years ago when he was just a little three-year-old heading off to preschool. In those ten years I’ve learned a lot about packing lunches and a lot of things have changed. The days of using cookie cutters and teddy bear picks are long gone, for example. And as he’s grown, so has his appetite. I used to pack his lunches in tiny Japanese bento boxes but now he needs something that will accommodate a lot more food. And way back then, his dad and I were the sole deciders of what foods he ate, but now the other kids at his lunch table — and his own changing tastes — play a big part in what he eats. Last school year — his first in middle school — was a bit of an adjustment for both of us, but after a few months a basic set of rules began to coalesce. 1. Lunch Gear is VERY important. His lunch box needs to be big enough to fit all the food he eats, but it also can not be embarrassing! We found that the Yumbox Tapas ($32) fits both these criteria. It’s about 50% bigger than a regular Yumbox (which has been a favorite around here for a long time) but the tray has more sedate illustrations than the smaller Yumboxes. In other words, it’s not too cutesy for a teenage boy. Another feature I love about the Yumbox Tapas, is that you can buy an additional four compartment tray ($16) and swap it for the five compartment tray depending on what your needs are on any particular day. When you want a lot of variety, you can use the tray with more compartments. If you want a big sandwich or a salad, you just pop in the four compartment tray. 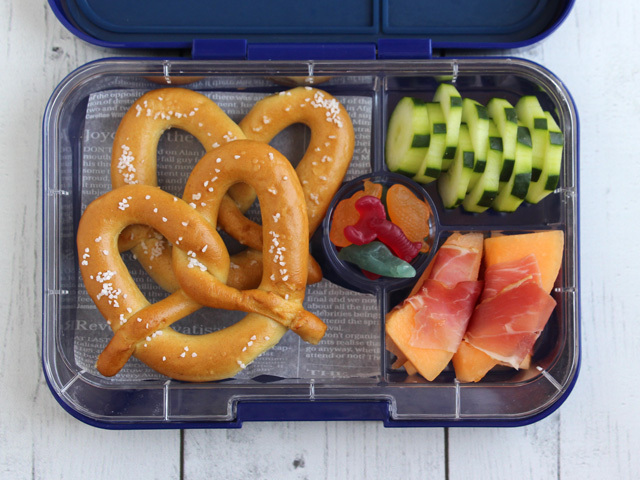 This is a big change from the previous Yumboxes because although they have 4 and 6 compartment options in the smaller size lunch box, you have to buy an entirely separate lunch set — outer box and tray — in order for the leak-resistant lid to work. The Tapas lid is designed to work with either of the trays — a nice way to save money. I should also note that the Tapas is too big to fit in most of our old lunch bags. That’s fine with my kid though because again, they have all been deemed too dorky for middle school. Instead we are using the Yumbox Poche — a simple navy blue pouch that is big enough to hold the lunch box, but slim enough to easily fit in his extremely crowded backpack. Win-win. If you think a cute lunch box is bad, it’s nothing compared to cute food in a lunch box. This one was an easy adjustment because he started saying no to most cute stuff in his lunches back in third grade and they’ve been completely cookie cutter and decorative pick free for several years now. But that’s not to say that I don’t try to make lunches for my son look nice. I still aim for a lot of color and variety in his bentos and I like to add visual interest by arranging the food attractively. 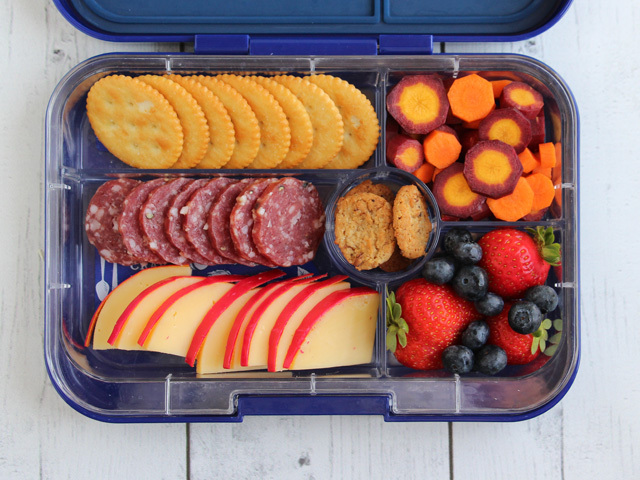 Here I’ve packed a fancy version of a Lunchable with neat fans of crackers, salami and gouda cheese slices, bright rainbow carrot coins, two kinds of berries and some small cookies. Nothing over-the-top, but the way it’s arranged makes you want to dive right in. It’s an understatement to say that the kids who my son eats lunch with influence the meals he wants. As they get older, kids definitely started to notice what others are packing in their lunches and junk food is the direction it all seems to be headed in. (It doesn’t help that the school cafeteria serves burgers, chips, and pizza almost exclusively.) Of course kids want these foods — they taste good! But I want my son to eat nourishing food, so my challenge as a parent is to try to find a middle space where he’s getting what the other kids have but he’s also eating lunches that have some nutritional value. One lunch that has been going over well is DIY tacos. 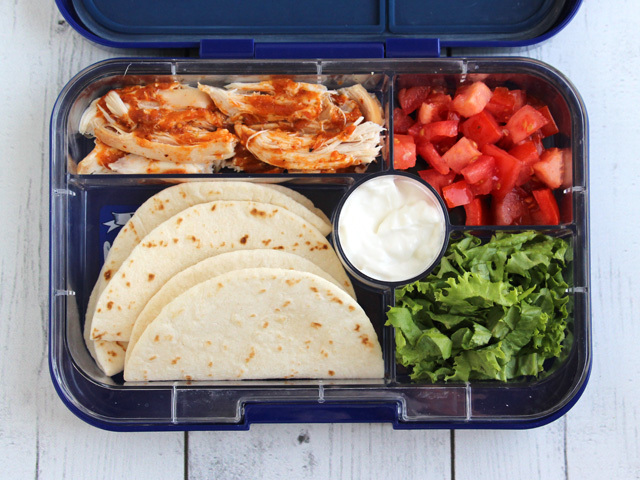 I fill the lunch box with mini tortillas, roasted chicken tossed with a little salsa and sides of sour cream, chopped tomato and shredded lettuce to top it all off. This one seems like a no-brainer, but you’d be surprised how often I head to the grocery store without asking my son what he’d like in his lunch. That is a very dumb strategy on my part because as he’s gotten older his tastes have changed and it’s opened up a lot of options for lunches. Sure, there are still times he answers “potato chips and Pop Tarts” when I ask him what he’d like in his lunches for the coming week, but there are also times when he tells me he wants a few salads. Yes — SALADS! 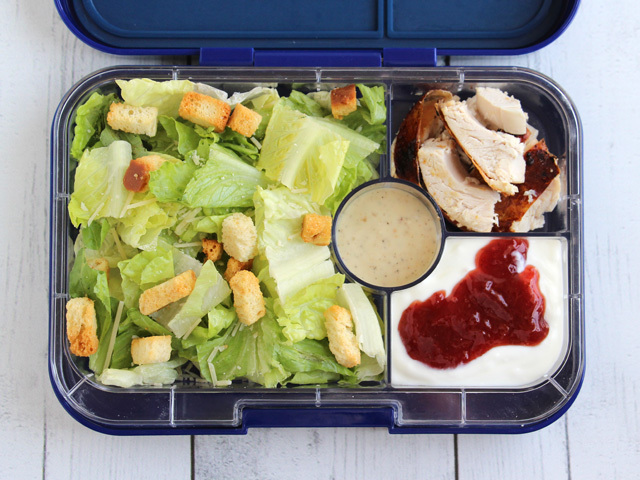 It’s pretty easy to buy a salad kit and pack the big section of the Yumbox with lettuce, cheese and croutons. The dressing goes on the side so the salad doesn’t get soggy and I throw in some rotisserie chicken for a little protein. Some unsweetened yogurt with a dollup of jam is a nice treat to round it all out. I know what you’re going to ask — do the dressing and yogurt get all over everything? Nope! The Yumbox Tapas is leak-resistant which means that runny stuff doesn’t go all over, but liquids might. I tested this lunch and the creamy dressing and thick yogurt stayed put. We’ve had mixed results with liquid-y vinaigrette though, so be sure you test stuff out before putting it in a backpack with that important paper! Have you changed how you pack lunches as your kids have gotten older? Got any tips to share? Leave them in the comments!